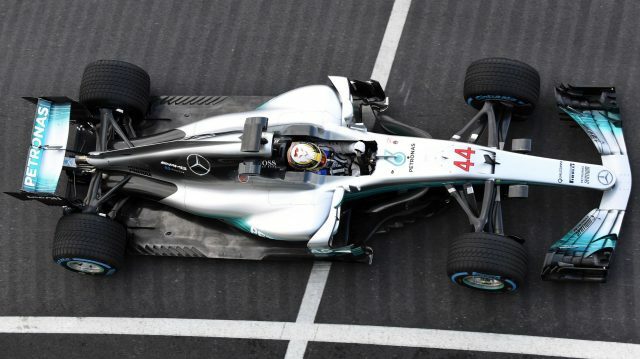 World champions Mercedes have put the first laps on their 2017 car. 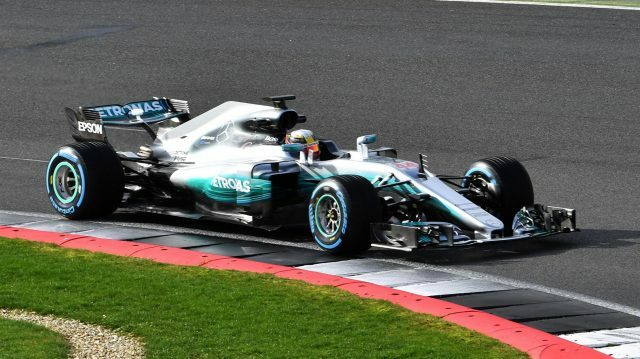 Lewis Hamilton was at the wheel of the W08 EQ Power+ for its track debut at the UK’s Silverstone circuit on Thursday, before the new Silver Arrow was officially unveiled to the media. Built to the much-revised 2017 regulations, the W08 is wider and lower than its title-winning predecessor, and features extremely tight rear-end packaging. The fin on its engine cover is also notably smaller than those seen on rival teams’ machines so far. 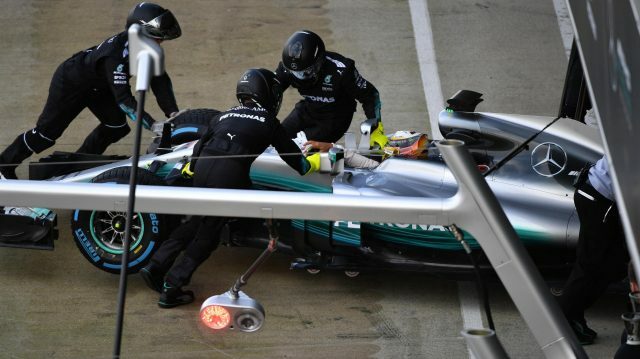 “In terms of relative performance, it’s clear that any rule change brings with it a big reset but also a big opportunity,” said Toto Wolff, Head of Mercedes-Benz Motorsport. “This is the time to stay humble and keep our feet on the ground. None of the teams has raced under these rules and we all have the same points right now: zero. Just 17 percent of the W08’s components have been carried over from its predecessor. In addition to the new shapes of front and rear wing, the floor and the barge board area in front of the sidepods have been the focus of significant development. 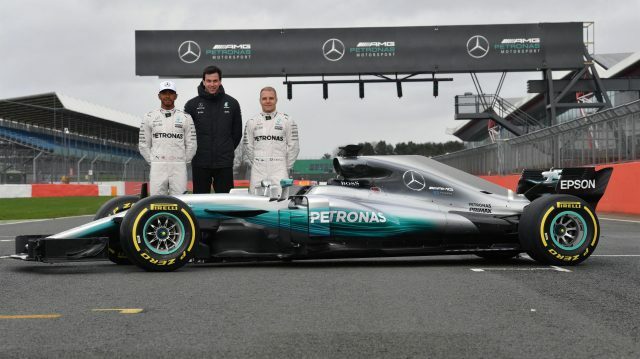 Mercedes’ design teams have also worked to improve the car structurally, in order to withstand the substantial increases in aerodynamic and mechanical loads resulting from the regulation changes. New team mate Bottas was equally enthusiastic about the coming season, the Finn’s fifth on the Formula One grid, but his first as a Mercedes driver. The W08’s ‘EQ Power+’ designation comes from Mercedes-Benz’ new product brand for electric mobility, with EQ standing for ‘Electric Intelligence’, and the car’s new livery includes an electric blue visual signature to denote its hybrid powertrain. That powertrain, christened M08, has also been comprehensively redesigned for 2017. The new aerodynamic regulations have had a significant impact on the configuration of the engine which, as a structural component of the car, must cope with significantly greater physical loads. To maintain its structural properties, the engine is therefore slightly heavier than its predecessor. And with the increased downforce available, the cars are expected to spend approximately 10 percent more time at full throttle – a change that is reflected in a five percent increase in race fuel allowance for the new season. Therefore, Mercedes have designed M08 for increased durability, with only four power units per driver permitted for 2017. The W08 will begin its pre-season testing programme at Spain’s Circuit de Barcelona-Catalunya next week, with Hamilton and Bottas splitting driving duties on each of the four days of running.